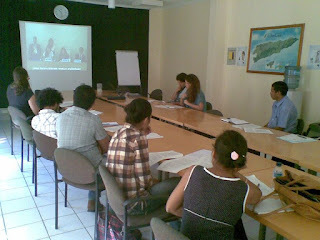 I speak for MADRE and for La’o Hamutuk, the Timor-Leste Institute for Development Monitoring and Analysis. We agree with the Special Rapporteur’s report. Half of Timor-Leste’s population lives in poverty, with little productive economy. With more than 95% of state revenues from oil and gas exports, Timor-Leste is afflicted by the “resource curse” -- inflation, waste, corruption, poor planning, neglect of human resources, import dependency and inattention to non-oil development. Timor-Leste plans to borrow billions of dollars. Debt repayments will start small, escalating when the oil is used up in about 12 years. At the same time, our post-war “baby boom” will reach working age. If the country has not built a strong, sustainable economy by then, it will be unable to support its huge trade deficit or provide basic services. When there is no oil money for subsidies or to trickle down, people will starve. Reduce 40% annual growth in State expenditures, while improving basic services for vulnerable people, especially women and children. Invest in health care, education, water and rural roads to let people raise themselves out of poverty. Stop borrowing and wasting money on huge infrastructure projects without much economic or social return. Strengthen the non-oil economy, especially agriculture and light industry, to reduce imports and provide livelihoods and basic needs. Help Timor-Leste take responsibility for its own development. We thank the Special Rapporteur and the Council for your support.